This article is about the demographic features of the population of Botswana, including population density, ethnicity, education level, health of the populace, economic status, religious affiliations and other aspects of the population. Demographics of Botswana, Data of FAO, year 2008; Number of inhabitants in thousands. Botswana, like many nations in southern Africa, suffers from a high HIV infection rate, estimated among adults ages 15 to 49 to be 24.8%. The seven censuses of Botswana before its independence happened irregularly. Due to the Anglo-Boer War, the first census of Bechuanaland Protectorate, originally set to occur in 1901, took place on 17 April 1904. The 1931 census was postponed to 1936 because of the Great Depression. The early censuses were unreliable and took several years to tabulate; the results were outdated by the time they were calculated. There have been five censuses after the independence of Botswana, each occurring every ten years in the year ending in 1 (i.e. 1971, 1981, 1991, 2001, and 2011). The 1971 census was the first census in Botswana to use de facto enumeration; this method counts people based on how many people spent census night at a specific location. Previously, the citizens were counted based on their usual place of residence. The 2001 census was the first census in Botswana to comply with the SADC 2000 Census Project, the guidelines of which unify the demographic statistics in southern Africa. The most recent census was the 2011 Botswana Population and Housing Census, which occurred in August 2011. According to the 2017 revision of the World Population Prospects the total population was 2,250,260 in 2016, compared to only 413,000 in 1950. The proportion of children below the age of 15 in 2010 was 32.6%, 63.4% was between 15 and 65 years of age, while 4% was 65 years or older. Source: Vital Statistics Report 2012. The following demographic statistics are from the 2018 CIA World Factbook. note: there is an increasing flow of Zimbabweans into Botswana and South Africa in search of better economic opportunities. Wikimedia Commons has media related to Demographics of Botswana. ^ "HIV & Aids in Botswana". AVERT International HIV & Aids Charity. Retrieved 15 January 2013. ^ a b c "History". Central Statistics Office. Archived from the original on 20 July 2012. Retrieved 20 July 2012. ^ "TABLE 1: 1971, 1981, 1991 and 2001 CENSUS DEMOGRAPHIC INDICATORS; BOTSWANA" (PDF). Gaborone: Central Statistics Office. p. 1. Archived from the original (PDF) on 20 July 2012. Retrieved 20 July 2012. ^ "The Population of Towns, Villages and Associated Localities" (PDF). 2011 Population and Housing Census. Gaborone: Statistics Botswana. June 2012. p. 1. Archived from the original (PDF) on 14 June 2012. Retrieved 20 July 2012. ^ a b "Population Division of the Department of Economic and Social Affairs of the United Nations Secretariat, World Population Prospects: The 2010 Revision". un.org. Retrieved 15 April 2018. ^ a b c d e f g h i j k l m "Africa :: BOTSWANA". CIA The World Factbook. This article incorporates public domain material from the CIA World Factbook document "2009 edition". 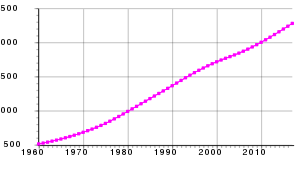 Botswana Demographics 2001 Central Statistics Office (Botswana), Census and Demographic Statistics for the year 2001. This page was last edited on 25 March 2019, at 00:26 (UTC).